Outcome Health’s co-founders – CEO Rishi Shah and President Shradha Agarwal – step down from their management roles as part of a settlement with investors who had claimed that the company misled them about its performance. Shah and Agarwal will remain on the company’s board as chair and vice-chair, respectively. They will also join Outcome Health’s equity investors and lenders in investing $159 million to improve its technology and customer operations. Outcome Health will expand its board to include new independent directors and will launch a search for a new CEO. It will also hire an outside firm to audit the performance of its waiting room ad campaigns, which was the subject of an investigative report suggesting that the company had inflated the numbers. Several big-name investors then alleged that the company had defrauded them of $500 million. A May 2017 fund raise valued Outcome health at nearly $6 billion, with the 31-year-old Shah’s stake worth $3 billion. It’s Apple — which has high consumer trust and high adoption rates — connecting via FHIR to EHRs. That’s significant news in itself. Patients don’t like and use patient portals all that much. Replacing little-used portals with an IPhone-stored aggregated record is a pretty big deal to consumers. Apple can extract and display whatever information the FHIR standard supports. The beta isn’t the end of Health Records development and it’s early to be whining about what it doesn’t do instead of celebrating the fact that Apple was interested enough in patient EHR data to use it as an IPhone differentiator in an increasingly Android world. If enough IPhone users want OpenNotes, diagnostic images, or anything else that’s stored in the EHR, they may eventually get it. It’s a big deal to give app developers a way to build and sell their products without the permission or participation of EHR vendors. Health systems may be overwhelmed with patients wanting their data or demanding that errors they find in it be corrected. From Apple The InfoBlockers: “Re: Apple Health Records. Your source said they were more comfortable working with Apple, but patients have a right to their data. Why does it bring over a subset of data but not pathology reports, radiology reports, notes, and genomic data? ONC railroaded the public with Meaningful Use that didn’t give patients the full data from their EHR, but this gets the word out about patient-centric interoperability. It also puts to bed excuses by provider / vendor info-blocking consortia like DirectTrust, who have argued that patients can’t participate without in-person identity verification and the Halamka argument that ‘we don’t make patient data available because nobody wants it.’ FHIR is one of the most powerful info-blocking tools out there and Argonaut in particular is a forum where providers define use cases that work behind the backs of patients. But that game is up since supporting a FHIR interface via a patient portal token means you can support it with any application the patient wants.” It may be that a tiny percentage of patients want to see their entire medical record, and even though there’s always the paternalistic fear that they might apply that information unwisely, I agree it’s their right. However, the average IPhone user is probably more interested in appointments, messaging, and quick access to lab results than second-guessing their pathology notes. Also recall that this is a beta release, a minimum viable product whose development will surely continue if demand exists. The reader observes that only three of the participating health systems use OpenNotes and Health Records doesn’t extract it anyway, so the patient portals of those three Epic sites will offer more information. I’m all for enhancing electronic records access, but what makes me really angry are the extortionate prices health systems charge patients to get even paper copies of their own records, especially when in-house technology makes producing them nearly effortless. From Madison Ashley: “Re: Apple Health Records. The story in a Madison newspaper says Microsoft has shut down HealthVault just like Google did its Health app in 2011.” It doesn’t say that, only that some of its software has been turned off (it’s referring to the just-retired HealthVault Insights). 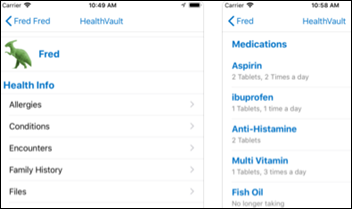 However, an error-filled article posted on a questionable health IT news site boldly declared that Microsoft has “shut down HealthVault,” only one of many mistakes it cluelessly stated as fact — HealthVault insights has not been “around since 2007,” HealthVault was never renamed to HealthVaults Insights, and Microsoft hasn’t ended its “mHealth app experiment” (although it might as well). Be careful who you trust for health IT news. From Bob: “Re: HIMSS exhibitor staff rules. I’ve search endlessly trying to find your rules from a few years ago, such as no talking on cell phones or to each other.” I’ve riffed a few ideas out several times over the years, so since I get asked several times each year right about this time, I started a permanent list. See my “Tips for HIMSS Exhibitors” and send me your additional ideas. 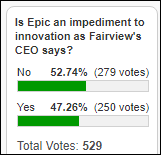 It’s a nearly even split on whether Epic is an impediment to innovation. Dev says the risk-averse health systems that spend hundreds of millions of dollars on Epic demand stability and that difficulty of integration is also a factor, adding that organizations can’t continue to wait two years for Epic to implement something and then take another year to run it by their in-house steering committees. Vic says both Epic and Cerner discourage third-party participation in installation, enhancements, and maintenance. Hermanator says its leadership, not the brand of EHR, allows provider organizations to innovate. Ex-Epic says the company’s aversity to PR and marketing mean customers, employees, and the health IT industry are kept in the dark, adding that Epic’s no-acquisition policy runs contrary to Silicon Valley, where everyone wins when side projects or acquisitions can change the world in the right hands. 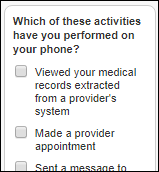 New poll to your right or here, as a follow-up to the Apple Health Records announcement: which of these activities have you performed on your phone? I’ve talked to a few former KLAS employees about how their process works. I would be interested in talking to a couple of additional people just so I get the full picture, all anonymously of course. Contact me. Listening: Massachusetts-based Speedy Ortiz, which overcomes an obviously limited inventory of talent to create some pretty good grungy rock. They donated their last tour’s proceeds to Girls Rock Camp Foundation. The singer studied math and music for two years before taking a poetry degree from Barnard College. The music is edgy enough to be interesting even when it’s not all that great. There’s also the new album from pastor and songwriter Cory Asbury, who crafts polished and highly listenable worship music. Welcome to new HIStalk Platinum Sponsor DocuTAP, which I’m sure will interest Dr. Jayne given her not-great EHR experience in her urgent care practice. 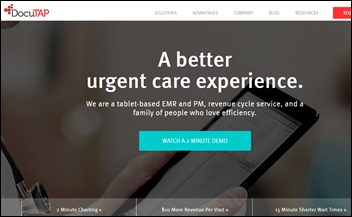 The Sioux Falls, SD-based company is the industry-leading technology provider for urgent care centers, offering a tablet-based PM/EHR, patient engagement, revenue cycle management, and business intelligence solutions. EHR features include a chart room to track patient wait times and complaints, templates that can be modified per provider and per clinic, automatically generated procedure codes, single-tap order sets, and automated E/M coding. DocuTAP also streamlines occupational medicine and workers’ compensation workflow that includes converting all forms to be filled out electronically and supporting employer-specific fee schedules. It offers connectivity with ACOs, state HIEs, and local hospitals. DocuTAP acquired Clockwise.MD in April 2017, allowing it to offer patient self-scheduling, wait time viewing, text reminders, and automated post-visit surveys. The company provides 24/7 support and offers certified remote hosting. Users benefit from two-minute charting, a $10 per visit revenue increase, and 15-minute shorter wait times. Thanks to DocuTAP for supporting HIStalk. For those questioning DocuTAP’s two-minute documentation claim, here’s a video showing it in action. St. Vincent’s Health Australia will expand its use of Vocera’s badge- and smartphone-based communication across its 15 hospitals and 17 senior care facilities. Perry County Memorial Hospital (MO) chooses Cerner Millennium delivered by the CommunityWorks model. Four-hospital Alameda Health System (CA) chooses Epic in a $200 million project. The health system nearly went broke following billing struggles after its $77 million implementation of Siemens (now Cerner) Soarian and NextGen in 2011. North Shore Medical Center (FL) switched from a Medhost EDIS to Cerner in late 2017. Stephens County Hospital (GA) will go live with Wellsoft’s EDIS in February 2018. Astria Sunnyside Hospital (WA) will switch from Meditech to Cerner in mid-2018. Washington County Regional Medical Center (GA) will replace Empower Systems with an inpatient EHR not yet chosen. Scott Decker (MDLIVE) joins Homecare Homebase as president. Allscripts says it has restored all systems after its January 18 SamSam ransomware attack. Meanwhile, Surfside Non-Surgical Orthopedics (FL) files a class action complaint against Allscripts, saying the outage caused it to lose revenue and spend money coordinating with patient. The practice says the industry has known about SamSam ransomware since March 2016 and Allscripts failed to take reasonable security measures to protect its systems. None of this has affected Allscripts shares, which are up 7.1 percent since the attack vs. the Nasdaq’s 6.13 percent. A new Reaction Data report asked 133 radiologists and radiology administrators about the potential use of AI in diagnostic imaging. 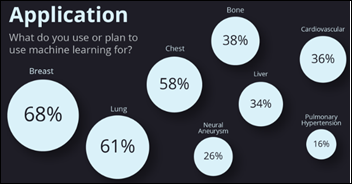 Most respondents say it’s going to a big deal, although practicing radiologists are skeptical. The report notes that folks who say they aren’t all that familiar with AI also responded that it’s important, a case of what Reaction data calls FOMO (fear of missing out). Most respondents say they will implement some form of AI by 2020, while imaging centers surprisingly seem to have fallen far behind hospitals in progress so far. IBM leads in AI mindshare even though nobody reported implementing anything from IBM – most of the progress is in breast imaging and Hologic, GE Healthcare, Google, and ICAD lead the pack. Hackers steal more than $500 million in cryptocurrency from a Tokyo-based digital currency exchange startup. In England, a newspaper’s report says doctors are being pressured to manipulate patient EHR data to avoid hospital penalties for missing ED treatment time targets. Sources say they are changing admission times, performing phony patient transfers that sometimes makes it hard to find those patients, and discharging and then readmitting patients to restart the clock. NHS standards require patients to be assessed within four hours of entering the ED and to be held no longer than 12 hours before being admitted, although the stopwatch starts only when they are taken to an exam room rather than when they show up, excluding their wait time watching My Lady Her Honour Judy. Google AI researchers publish (in a non-peer reviewed, non-medical open access journal) their work on extracting full EHR data from 215,000 hospitalized patients (from UCSF and University of Chicago Medicine) to successfully predict in-hospital deaths, unplanned readmissions, prolonged stays, and discharge diagnoses. 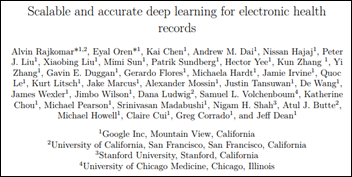 The authors conclude that analyzing the full EHR with deep learning methods provides predictions that are more accurate than other predictive models that require data harmonizing and a pre-defined statistical model. Providers will contribute the electronic information of all patients to the NEHR. The core data set will include the patient profile, events, diagnosis, surgery procedures and notes, discharge summary, medications, lab reports, radiology reports, immunizations, and allergies. Patients can opt out, but their information will still go to the NEHR. It will, however, be made invisible to providers. Sunquest Information Systems will offer several presentations at the Precision Medicine World Conference January 23-24 in Mountain View, CA. Can you name a few friends or family members with a serious condition (say, cancer) who DON’T want their full records? Or even who don’t already try to maintain them themselves in boxes and binders? 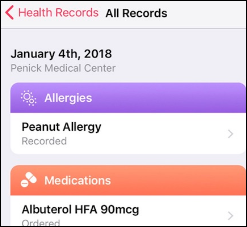 Apple’s announcement include quotes like this “Putting the patient at the center of their care by enabling them to direct and control their own health records…” Can patients really do that with what patient portals (and thus, by extension, Apple’s solution) currently gives them? Not to mention the use-cases (precision medicine, second opinions, etc.) described in other publications that reprint the Apple announcement? Does HIPAA have a clause I don’t know about that says that healthcare providers don’t have to make COMPLETE copies of ALL electronic medical records available to patients who want them in WHATEVER WAY THE PATIENT WANTS (even if they don’t have an Apple device) as long as they are technically capable (which clearly every provider in the Apple announcement is) based on the percentage of patients that Mr H thinks want them? Do the Office of Civil Rights memos re. patient “right to access” say that its up to your health system source to decide which vendors they are “comfortable working with” or is that just another way of saying they are Information Blockers / civil rights violators when it comes to patient “right to access”? Mr. H – you are right to be angry about the per-page printing fees and the “we only offer paper records in 30-60 days from our records department” approaches of many providers. And you are also right about what typical Apple consumers want/need. But that doesn’t let health systems off the hook from full HIPAA “right to access” compliance for whatever percentage of patients want it. This announcement from Apple is another step in the right direction when it comes to patient “right to access” and interoperability – but it’s time to start holding HL7, DirectTrust, Argonaut, SMART, and every other provider/vendor consortium accountable to the LAW (its spirit and its letter). Meaningful Use let them get away with doing a bare minimum. That is now limiting what Apple can offer. That is NOT the bar – the bar is COMPLETE access to all electronic data stored on behalf of the patient. Enough “wow, look, Epic and Cerner are talking to each other, isn’t that wonderful!” as if that is the issue. Enough “we transfer a gazillion records every day from one EHR/HIE to another” claims (OK, but what does that have to do with PATIENT access?). The issue is patients being able to get their complete electronic records without hassle. It’s the law. It’s completely doable and has been for years. It’s not happening because we let healthcare providers, EHR vendors, and the organizations / spokespeople (all the “interoperability celebrities”) that they fund/sponsor get away with this nonsense. This Apple announcement demonstrates (what every insider knows) that there are no and have been no technical obstacles to doing this for years (FHIR is nice, not required)… that the excuses around security were lame (portal login is sufficient security and even portal sign up is still too onerous on many sites – healthcare is no different than financial services in this regard despite all the fear-mongers at ENHAC and the like). True, not all patients know how to transfer bitcoin to ransomware authors (apparently the key skill that healthcare providers and payers have to ensure security of patient data), but I’m sure they’ll learn if they need to. The “patients don’t want their data” claims are insulting, and the real issue is the “we own your data” (the law be damned) mindset of healthcare providers. Ref: “Apple the Infoblockers” – “ONC railroaded the public with Meaningful Use…” Amazing how many people still think ONC was responsible for Meaningful Use. (It’s CMS…). Statements are much more impactful when accurate….! Judy Faulkner is the Donald Trump of healthcare IT. She’s just smarter than everyone else. I’ve completed against them going back to when they were physician practice focused only. Customers don’t choose Epic. Epic chooses its customers.